editor after the list had been signed off. That's not exactly good. The magazine's rationale was that GDI had to stand over the rankings and there were certain changes that weren't justified... but isn't that the whole point of having an 'independent' panel. 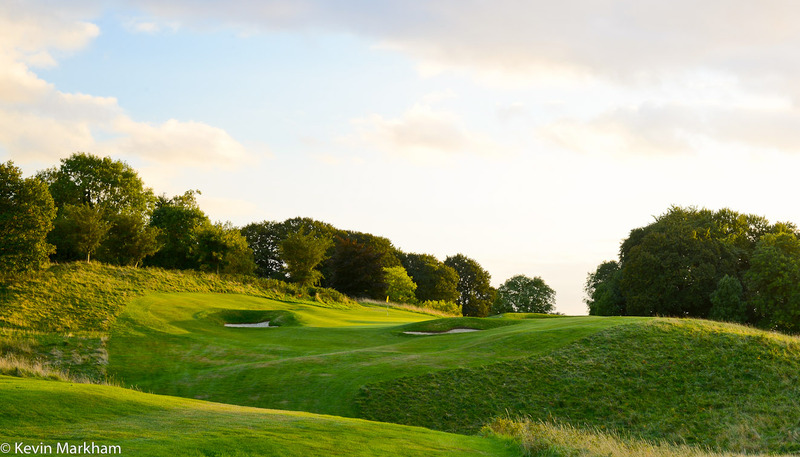 Most of the changes were small, but one of the most obvious was Castle Golf Club pipping Grange for the first time in the ranking's history. The editor changed that back. So what about this year? Let's start with the obvious - Christy O'Connor Junior is now a significant player on the panel. It is no surprise therefore that a couple of his courses have moved up the table. 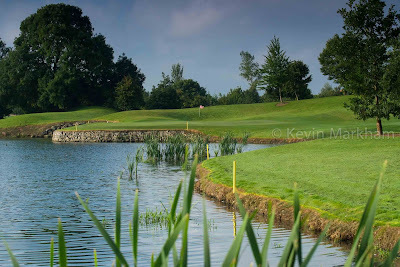 Galway Bay is up 10, Knightsbrook is up 3, Concra Wood up 2, Mount Wolseley is up 1. 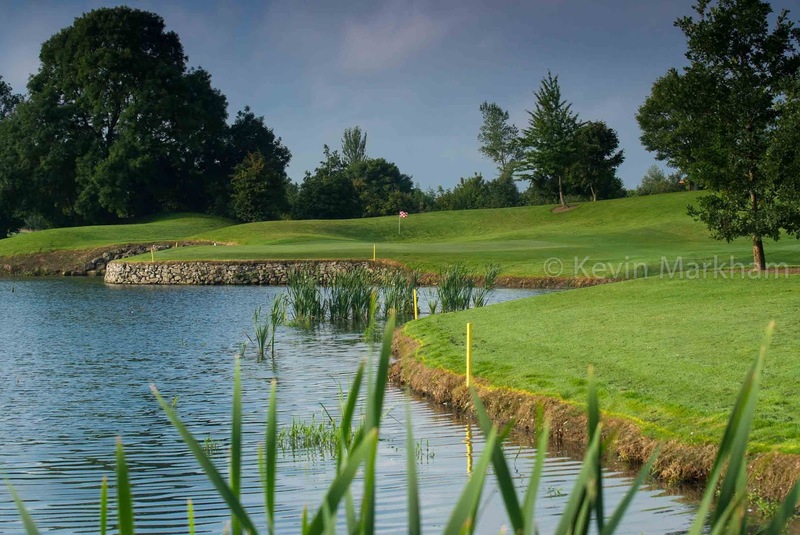 The course he is redesigning at Moyvalley is a new entry (98). I like the course, but entering the top 100 at this stage is a total joke. The course is simply not there yet. And I expect that next year, after the redesign work is done, it will move up some 10 places. That's not to say all of his courses rose: Headfort New and Palmerstown Stud stayed the same and Esker Hills has dropped 2. 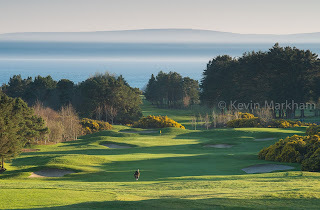 And besides, I'd say that both Galway Bay Resorts and Concra Wood fully deserve to be higher up. It is fantastic to see North West finally making it into the rankings. Long overdue... long, long overdue. 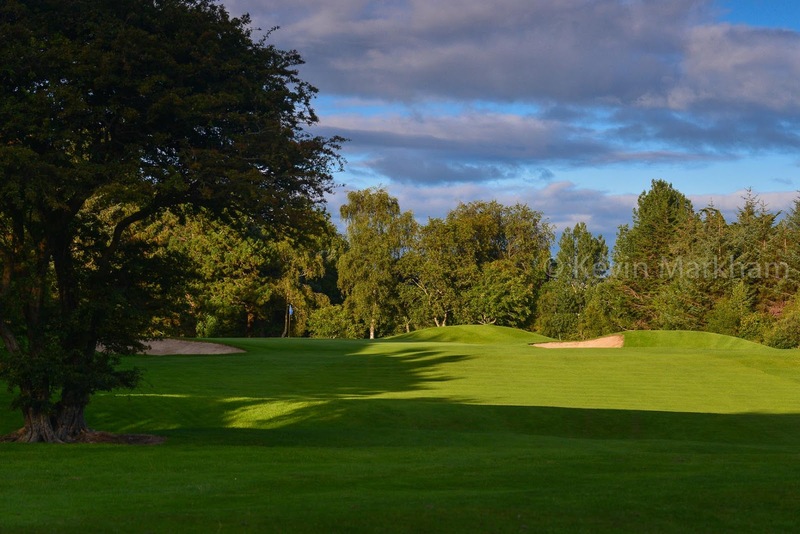 The course celebrates its 125th anniversary next year. 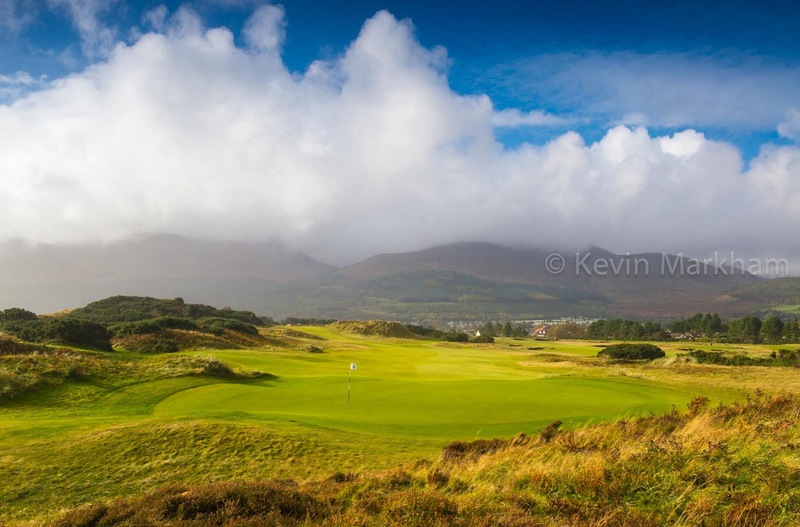 Make an effort to get up to Inishowen to play it. 1. 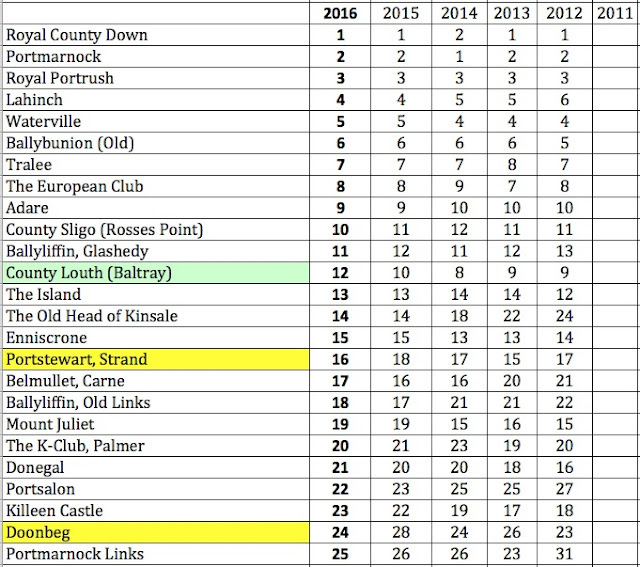 Dooks and Doonbeg have swapped completely. Dooks is down 4. Doonbeg is up 4. 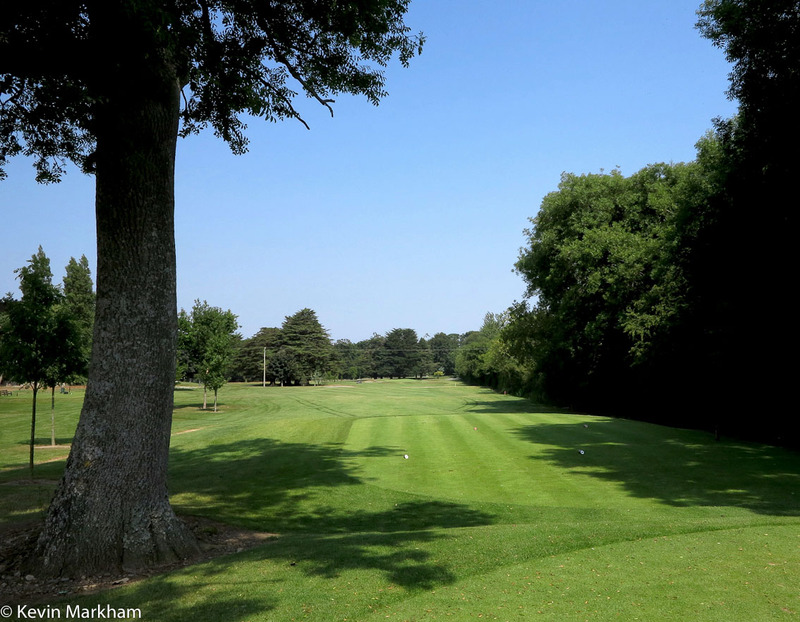 Dooks' greens are among the best in the country and the course has been given some nice professional touches following their 125th anniversary. 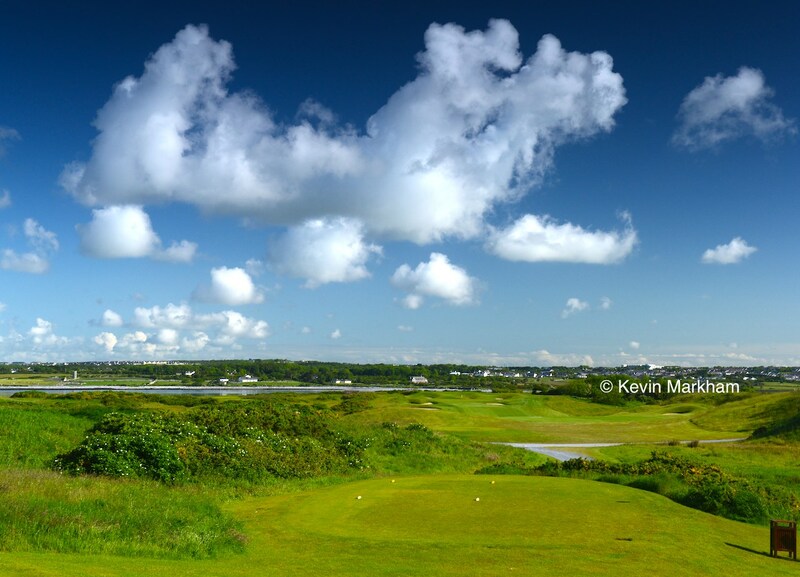 Doonbeg, on the other hand, is being upgraded and these upgrades are not yet complete. How can it go up? 2. 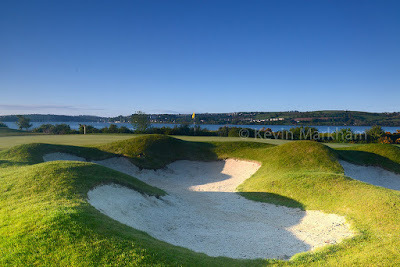 Cork Golf Club is down for the 5th year in a row. Down 4. Again, the club has made recent and significant changes to its bunkering, taking it back to its MacKenzie roots. 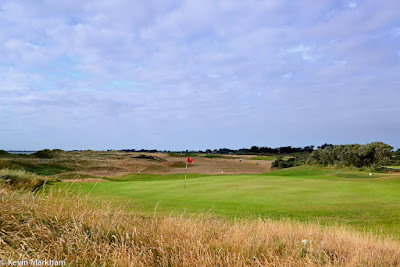 It is undeniably a better course as a result. How can it still be dropping? 3. The Heritage is down 9. Wow! 4. Strandhill up 5 to 65. Fabulous! 5. Rathsallagh is gone altogether. No surprise. It'll be back in next year after the course reopens. 6. 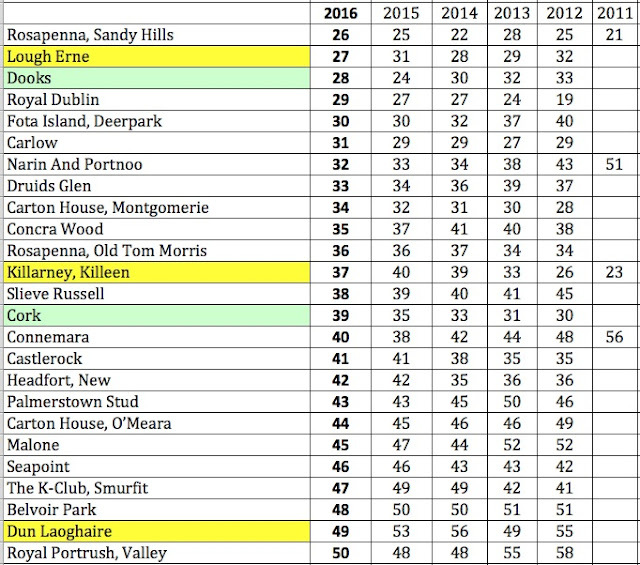 The red type indicates oddities: Macreddin is listed as a New Entry but it was a new entry last year. It stays at 100. Dingle is listed as being 'up 3' (to 75) but it is actually in the same position as last year. 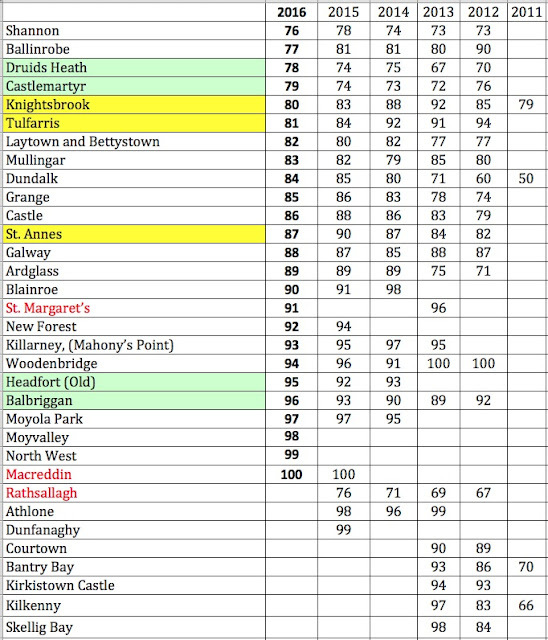 And St Margaret's is listed as being 'up 2' (at 91)... but it is a New Entry. Simple mistakes... not to mention copy being cut/pasted from last year's Top 100 edition. That's just lazy (and undoubtedly explains why Dingle is listed as being 'up 3'). 7. And then of course there are all the courses that both you and I believe should be on that list... it's just a question of which ones should come off in their place. I could list 10 to be included without batting an eyelid... and the 10 which they would replace. Green highlight is for significant fallers. Yellow highlight is for the risers. Everyone has their frustrations with this sort of ranking. It's no surprise. Not one of us would ever agree on a top 100, but my biggest issue remains that this ranking is taken seriously around the world because it's got 'Golf Digest' written all over it. It's not a great ranking... but it is a fabulous talking point. What do you think is the best ranking Kevin? William, I am not being facetious here... but the best ranking is your own!! Other than that, I am involved with the Golf World ranking so it is one I'd rate highly. Never meant to imply you were being facetious Kevin. As a person not fortunate enough to have played all, or even a good sampling, of the top 100, I'm very curious about these lists. You're quite right in your next posting that it makes a difference to the courses. 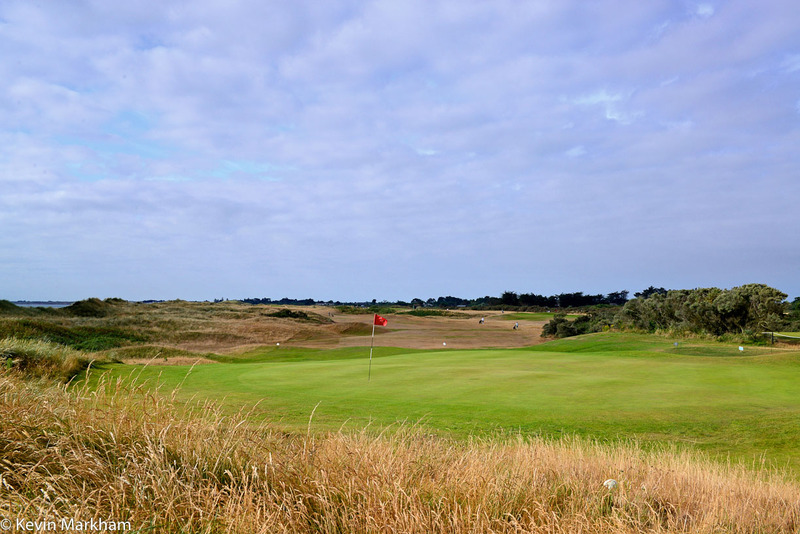 When planning a trip, you need something to rely on in order to pick where you'll play. Golf Digest's name is generally relied on world wide. I did notice a lack of transitivity [great word for scrable there] in GD's rankings. 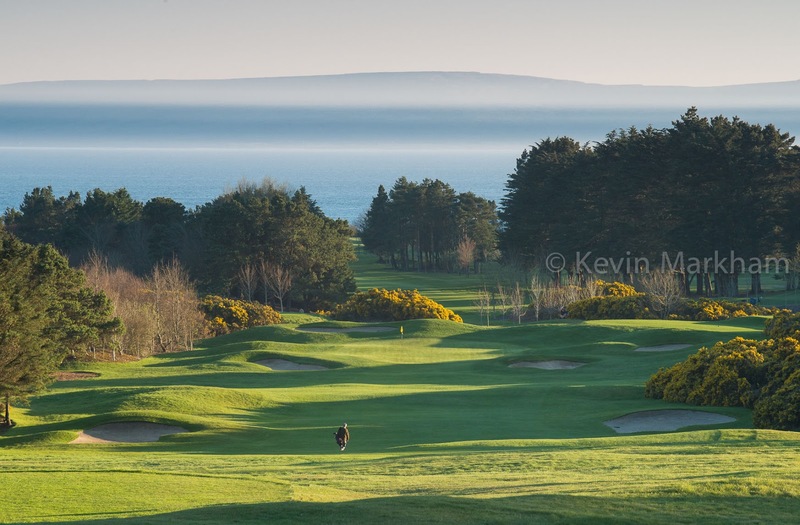 The easiest example is Lahinch, Ballybunion, and Waterville. 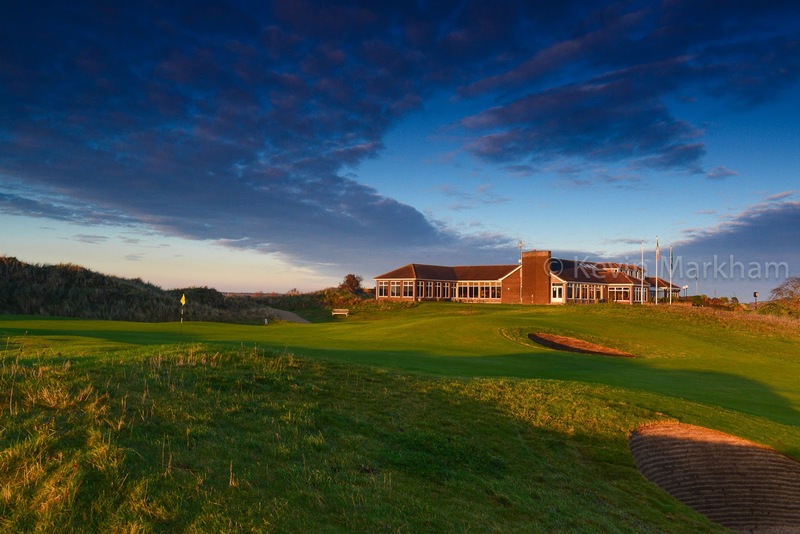 The GDIE list ranks the order as Lahinch, Waterville, Ballybunion while the GD world list ranks them Ballybunion, Lahinch, Waterville. Which is better? I'm not sure, I'll need to visit the southwest. All I can garner from those rankings is that they're worth visiting. 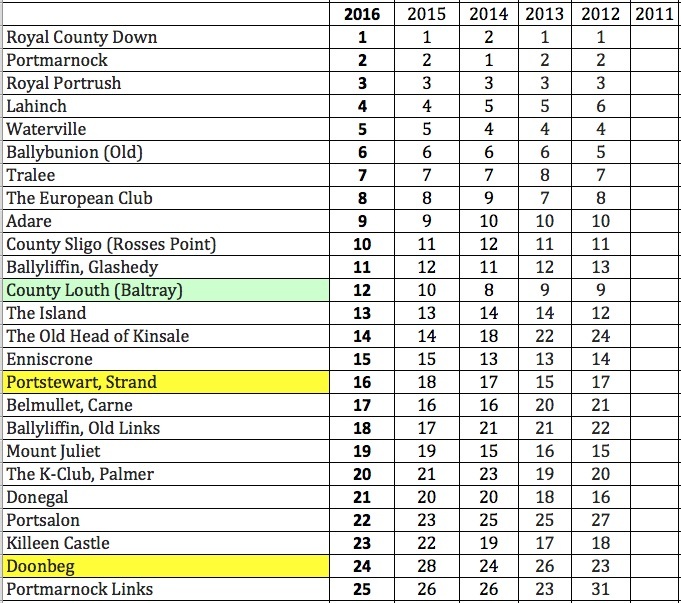 Portsalon has absolutely no business being in the top 25. Ballyliffin Glashedy should be in the top 3 as it is a truly remarkable golf course that ticks off every box in golf excellence. 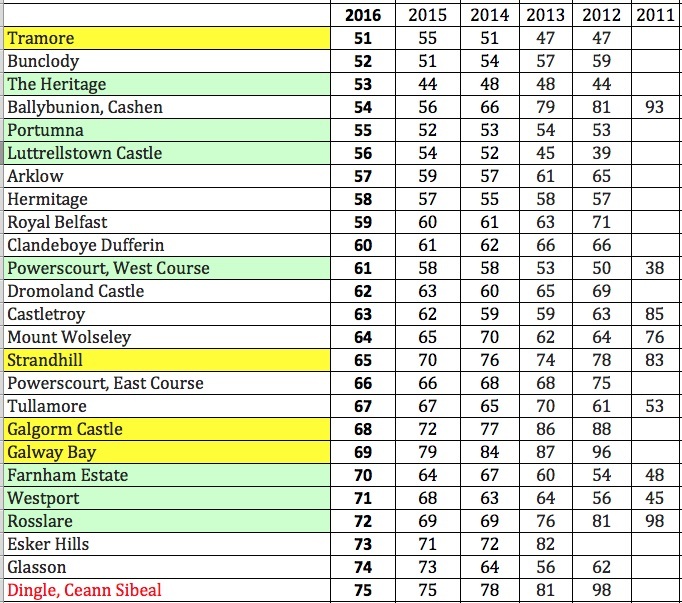 Until the greens are back to there standard they were 15 years ago, Ballybunion doesn't deserve to even be in the top 20. They are terribly slow and the millions of euro (1.8 million on the greens) that has been spent on the course is mostly awful, thoughtless and purely aesthetic. I can't agree with you on any of those points, Karl, but it's good to see you shoot from the hip. And isn't that what rankings are all about - you compare them with your own.